Einkofi Productions in partnership with Curated Place and Absolutely Cultured hosted artist Dodda Maggý in the UK to explore the stories, memories, myths and people that connect Hull and Grimsby, to Iceland. Responding to the theme of Urban Legends her investigations will draw on a series of seafaring legends, and highlight how our creation of mythos has shifted from the supernatural threats of the deep to the man-made threats of “the other”. Dodda's new work focuses on the impact technology has on the creation of identity through storytelling and how the manipulation of communications space has been used both as a nurturing force and one of subterfuge. Using both archive & heritage collections alongside original personal testimony collected from both Icelandic and Humber communities through interviews, she aimed to question how we became the monsters once attributed to the mysterious deep. Artist and composer Dodda Maggý worked alongside The University of Hull, archives and museums in order to explore the connections between the UK and Iceland. The large-scale light installation was developed as part of our European Year of Cultural Heritage project. Working together with The University of Hull, Dodda created a new music and light installation piece which was performed by a new ensemble formed from the University. Drawing inspiration from the connections between Hull and the countries across the North Sea in Northern Europe and Scandinavia, Urban Legends: Northern Lights sparked conversations about the common stories shared between these places. 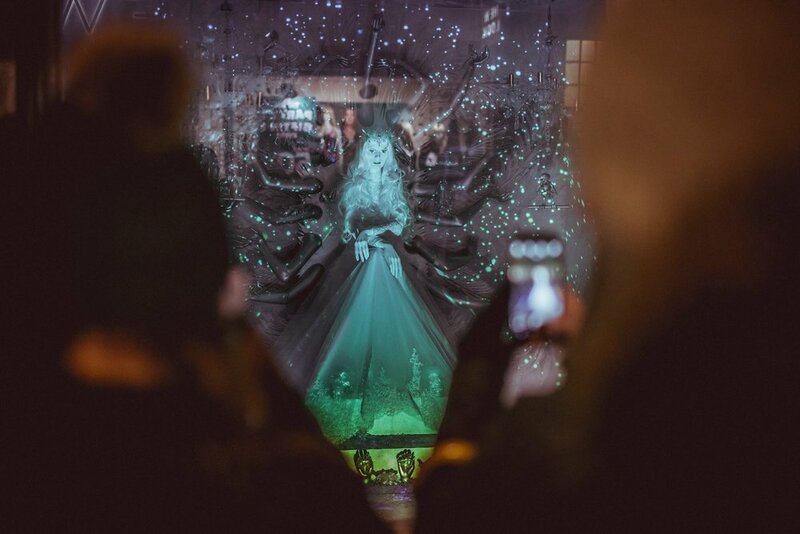 Taking inspiration from ancient mythology, fairy tales and oral history, the buildings, pavements, shop windows and winding alleys of Hull city centre were the pages on which stories were told. From large and impressive to intimate and moving, the city was at its dazzling winter best as the event brought together artists from the UK and Scandinavia. In collaboration with Absolutely Cultured, Curated Place were proud to present Dodda Maggý’s work Alda (meaning ‘wave’ in Old Norse) at this spectacular event. Other leading artists at the event also included Anna Heinrich and Leo Palmer, imitating the dog, NOVAK, Studio McGuire and Zsolt Balogh, with contributions from other collaborators. Many of these artists were already familiar with the city, with previous work celebrated in Hull during its year as the UK City of Culture 2017. Dodda Maggý is an Icelandic artist and composer based in Reykjavík. Her practice centres around research of time-based media ranging from formal studies of the structural relationship between the visual and the aural to exploring the ethereal qualities of video, sound and music. A reoccurring theme in her work is the pursuit of giving form to perceptual experiences. Producing audio/visual installations, purely sound based work, musical compositions or silent moving images, Dodda attempts to externalise the internal dimensions of the sensorial and the fantastical presence and mode of communication. Through a dreamy and sensory imagery, she draws on features common to classic filmmaking, using music as a vehicle to elicit the underlying narratives. Dodda’s musical film compositions constantly give you the sense that something’s afoot beneath the surface; that there’s more to it than meets the eye. Dodda Maggý holds two BA degrees from The Iceland Academy of the Arts, in Fine Arts and in Musical Composition, and an MFA from The Royal Danish Academy of Fine Arts. She is also a participant in the Nordic Sound Art program, a two-year MFA level study program in Sound Art at The Royal Danish Academy of Fine Art, Malmö Art Academy, Oslo National College of the Arts and Trondheim Academy of Fine Art. She has exhibited her work worldwide including - New York, Los Angeles, Hong Kong, Sydney, Johannesburg and through- out Europe. In 2018 Dodda Maggý was the 19th recipient of one of the most prestigious arts awards available in Iceland, the Guðmunda S. Kristinsdóttir Arts Fund for her contribution in the field of art.